Get real-time fitness stats right on your wrist with the Fitbit Alta HR Fitness Wristband. The OLED tap display tracks your steps, sleep patterns, heart rate, and much more. You can even set reminders to move so that you achieve your 250-step hourly goal! This is the perfect holiday gift to get loved ones moving! Enjoy your music wirelessly with the black JBL Playlist Wireless Speaker. It features Bluetooth and Wi-Fi technologies with Chromecast built-in to connect to many types of wireless components, plus an 1/8" audio input for wired device connectivity. It has two 2.25" woofers and can be setup and controlled wirelessly with the Google Home app. This is the perfect holiday gift for anyone that loves music! Bring the party wherever you go with the iHome iBT175 color changing rechargeable Bluetooth speaker! The iBT175 has two audio sources: Bluetooth wireless audio streaming from your Bluetooth-enabled device, or direct audio via the aux-in jack. Built-in mic, digital voice echo cancellation and answer/end controls make speakerphone use a pleasure. 360° sound with four speakers fills the space with sound. There are five color changing modes with multiple colors at the same time for fun, fabulous color effects and the Party Mode button gets the party started instantly! Works with the free Melody voice powered personal music assistant app to play music from Spotify, iHeartRadio and more! Give the gift of the world’s smallest pair of Bluetooth stereo speakers! The Pred Technologies Cube Stereo is a super-small profile speaker that truly lets you enjoy music on the go! You can connect them wirelessly to your smartphone, tablet, or laptop and just hit play. The speaker pair syncs without cables so you can enjoy stereo sound from over a 30-foot range. Each speaker is equipped with a magnetic backing so you can attach them to your toolbox or any other magnetic surface. The speakers are ultra-compact and have surprisingly big sound which make them the perfect gift for any adventurers on your shopping list! Listening to music and working out has never been easier with the Jabra Elite Sport Enjoy! Their innovative hear-through technology lets you filter in background sounds when you want, and an in-ear heart rate monitor helps you track workout goals! 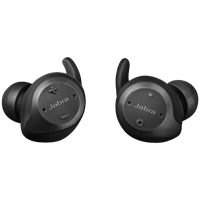 When paired with the included charging case, these Jabra Elite Sport wireless earbuds deliver a total of 13.5 hours of battery life. They make the perfect gift for those with an active lifestyle! Give the gift of wireless quality sound with the Cleer DU Wireless Headphones! The headphones feature Bluetooth® 4.1 support, NFC easy pairing, and built-in aptX® and AAC codec support. The headphones easily fold, feature alloy construction, soft earpads/headband and provide comfort at-home or on-the-go! Dual, neodymium drivers and a robust amplifier deliver deep and engaging audio response. With earcup mounted controls, you can easily control playback. The quality sound of the Cleer DU Wireless Headphones are remarkable - that's why it makes the perfect gift! The ​JBL® Everest™ Elite 700 Bluetooth Headphones enable simple wireless streaming from a variety of Bluetooth-enabled devices. The headphones feature a rechargeable lithium-ion polymer battery which offers hours of music playback on a full charge. The auto-off feature automatically shuts off the headphones when not in use to conserve battery life. The NXTGen Active Noise Canceling technology Minimizes ambient noise with the push of a button for immersive sound. The 40mm drivers and TruNote Auto Sound Calibration automatically calibrates output for optimal audio performance. These headphones are the perfect gift for anyone that enjoys great sound! The tech21 Evo Check Lace Edition Samsung Galaxy 8 Phone Case offers​unbeatable drop protection that uses modern-lace design to give your phone a unique twist! tech21 features great phone cases and screen protectors at affordable prices for a wide range of phone models. Their products are perfect for anyone that wants to keep their phone protected and stylish! The Vibes Audio BASEROX modular smartphone case protects your phone and has a sleek design! With this innovative case, Vibes Audio delivers a whole new way of enjoying and sharing smartphone accessories. As part of a Modular Smartphone System, the BASEROX case can be connected to various accessories such as the VIBROX Sound Engine, the VOLTROX Power Bank, and much more! This is the perfect gift for anyone that wants to have the latest and greatest in mobile accessories! The Samsung Galaxy S8 makes a wonderful gift this holiday season! The phone has a host of incredible features including the world's first infinity screen, powerful performance with the first mobile 10 nm chip, premium dual cameras and a defense-grade security platform offering fingerprint and iris scanners. The features and the design of this smartphone make this the perfect gift for any android fans. With the Sprint Unilimited Plan, you can have unlimited calls, texts, HULU and more for only $25/month! The ZTE Axon M dual-screen smartphone from AT&T opens a world of simultaneous messaging, gaming, and streaming entertainment! Dual screens bring you entertainment and the ability to multitask effortlessly. You can watch your favorite show on DIRECTV with one screen while messaging a friend on the other screen. You can update your Facebook status while checking your calendar- the possibilities are endless! The phone also features a TV Mode Quick Launch button for instant access to your favorite shows and movies! With AT&T service you can watch DIRECTV NOW on your smartphone anywhere at no extra charge! Literally give the gift of entertainment and versatility with the ZTE Axon M this holiday! The Samsung Galaxy S8+ has the cutting-edge features you need to do the things you love faster, easier and better! The 6.2" inch curved display goes all the way to the edge allowing you to see more faster! The 12MP camera with an advanced processor takes sharper, clearer photos faster than ever before. Available in Orchid Gray, Arctic Silver or Midnight Black- there is a perfect color for everyone on your holiday shopping list! A phone this advanced deserves the most advanced network- and the only network that fits the bill is Verizon! Now with the current promotion when you add a Samsung Galaxy S8 or S8+ to your online shopping cart on Verizon.com with monthly device payments you can get a second Galaxy of equal or lesser value for free (see verizon.com for details)! ​Capture more fast action and record more Full HD or 4K UHD video2 with your Android based smartphone, interchangeable-lens camera, drone or GoPro® action camera with the SanDisk Extreme microSD UHS-I Card! These cards are built tough for extreme durability under challenging environmental conditions. Extreme speeds let you capture every detail of adventure and take the wait out of transferring your videos between devices. The storage capacities range from 32GB to 128GB and make a great holiday gift for any adventurers in your life! Don’t let running out of storage keep you from capturing that perfect moment! The Kingston DataTraveler Bolt Duo is an easy way to extend storage space to your iPhone® or iPad®. Think of it like a flash drive for your iPhone. Simply plug it in, download the Bolt app, and then back up your camera roll! This is the perfect gift for any travelers on your holiday shopping list! ​The SanDisk Connect Wireless Stick is the flash drive reinvented to work not just with your computer, but also with your phone and tablet. With the SanDisk Connect Stick in your pocket, in your bag or across the room, you can wirelessly access your media or transfer large files, stream HD videos and music, and save and share photos and videos to and from your mobile device! Delivering up to 256GB of extra capacity, the SanDisk Connect Wireless Stick gives you access to all your stuff in an instant! This is the perfect gift for someone on the go! The Kingston ​DataTraveler microDuo 3C features a dual interface that accommodates a USB Type-A and USB Type-C ports. The microDuo provides additional storage for newer devices with limited expansion ports. It also features fast data transfer speeds up to 100MB/s read and 15MB/s write! The Tile Style is the stylish way to keep track of your device/keys. It features their most powerful Bluetooth tracker yet. In addition, it's twice as loud, has twice the range and is waterproof up to 1.5 meters for 30 minutes! This is the perfect gift for ensuring that your loved ones don't lose their phones or keys! The new Roku Ultra is the ultimate streaming player for HD and 4K Ultra HD TVs! It comes fully loaded and delivers powerful streaming quad-core processing and 802.11ac dual-band wireless plus brilliant 4K* and 1080p HD streaming at 60fps, and vibrant HDR* color! The player also features a lost remote finder, digital optical audio output, point anywhere remote, voice search, and headphones for private listening. This is the perfect gift for anyone that loves streaming their favorite movies or shows! connection. It's also safer to store your important files and memories on your personal CatDrive versus on the Cloud. You can create multiple user which allows each user access to their own private space. CatDrive is the perfect solution for those that don't want to spend money on cloud based storage solutions and allows you easy access to your files from any device that has an internet connection! This is the perfect holiday gift for anyone that wants security and instant access to their files! Crafted from anodized aluminum, the 13400mAh RazorPlatinum is not only the most powerful portable charger in the myCharge lineup but also the only charger capable of powering a laptop. The USB-C port delivers a 36W output and is able to fully charge a MacBook in 100 minutes. Charge any tablet, smartphone or other device via the RazorPlatinum's standard USB-A port. Recharge the RazorPlatinum via the MacBook 29 watt adaptor in just 2 hours! The Anker PowerCore II 20000 Portable Charger intelligently identifies your device to deliver the fastest possible charge! It's packed to the brim with days of power and can charge an iPhone 7 over 6 times! The charger can be recharged in as little as 5 hours using a Quick Charge charger. This is the perfect gift for anyone on your holiday list that is always on the go! Designed to replace the heavy and bulky generators used when tailgating or camping, the AdventureUltra is a streamlined power source that can run a 42-inch television for up to three hours. The AdventureUltra has a maximum power output of 45 watts, enough to run a fan or recharge a drone battery or can even charge a laptop! It's the perfect gift for those that love tailgating or camping! The Oska Pulse enables you to live an active and pain-free lifestyle! Using a series of eTecTM electromagnetic pulses, the Oska Pulse delivers relief from pain and promotes joint and muscle recovery without the use of dangerous drugs. The Oska Pulse includes a large compression wrap, bag and a USB cable to recharge the device. This is the perfect gift for anyone that lives with pain and wants relief! Utilizing soothing heat and Transcutaneous Electrical Nerve Stimulation (TENS) technology used by physical therapists and chiropractors, the ​Omron Heat Pain Pro TENS Unit is the perfect gift for those that want to relieve pain. The unit features 9 pre-set pain programs (Arm, Lower Back, Leg, Foot, Joint, Shoulder) and 20 adjustable levels of power intensity to help relieve pain almost anywhere. The unit is small, portable, easy-to-use and can be used discretely anywhere. It includes comfortable self-adhesive gel pads that are reusable up to 30 times. ​Keep your head in the game when you wear the HyperX Cloud Stinger headset! It works with most PCs and the PlayStation 4 for versatile gaming applications, the swivel-to-mute microphone ensures your personal conversations stay out of battle scenes. This HyperX Cloud Stinger headset has memory foam ear cups for long-lasting comfort as you quest and makes the perfect gift for any gamers on your holiday list! ​The Logitech MX Anywhere 2S Mouse features Darkfield Laser Tracking which works on virtually every surface, even glass! This mouse connects to your computer wireless via Bluetooth. The mouse features buttons that provide access to frequently used commands and functions for powerful control and a scroll wheel that enables smooth, fast movement. The mouse is compatible across a wide array of computers and makes a great gift! and is PC and Mac compatible over USB. This keyboard is perfect for gamers and anyone that wants a high-quality keyboard!